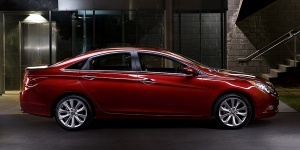 The Hyundai Sonata is completely redesigned and reengineered for 2011. The 2011 Sonata comes in a wide range of models, including a hybrid that can be driven at highway speeds in fully electric mode, and a turbo designed to deliver fuel-efficient acceleration performance. A V6 engine is not available anymore. Find the used Hyundai Sonata of your choice from a dealer in your area. Search our used car listings now.